Behind a hat-trick from junior forward Jordan Greenway, the Boston University men’s hockey team topped the University of Massachusetts Lowell, 9-3, at Agganis Arena Saturday. Following a heartbreaking 3-2 loss at Tsongas Center Friday night, BU (8-10-1, 6-6-1 Hockey East) responded with an aggressive mindset, taking 47 shots to the River Hawks’ (9-8, 6-6 Hockey East) 17. Sophomore forward Patrick Harper also recorded a pair of goals for the Terriers, who head into an almost four-week winter break with momentum. The Terriers got on the board just 2:45 into the game. 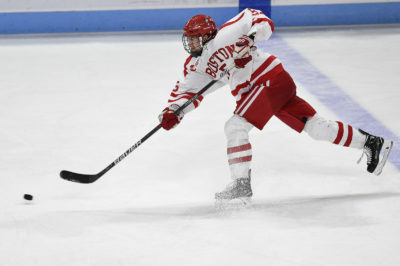 Continuing his result stretch of solid play, graduate transfer forward Drew Melanson found a cutting freshman forward Brady Tkachuk on the left wing in stride on a two-on-one opportunity. The freshman then deked River Hawks sophomore goaltender Tyler Wall with ease, depositing his fourth goal of the season to give BU the 1-0 advantage. The Terriers struck again just two minutes later, as junior forward Bobo Carpenter gained control of the puck on the left wing on a penalty kill and drove around Wall’s backside. He then flipped a pass in front of the goal and it found the stick of Greenway, who flipped it to the right of Wall and in for his first goal of the game. Eleven seconds would be a key number for BU. After Lowell freshman forward Connor Sodergren tripped up Terrier freshman defenseman David Farrance to land in the penalty box with just under six minutes remaining in the first period, BU scored 11 seconds into the man-up attempt. Receiving space at the right faceoff dot, Harper wound up and ripped a laser past Wall’s glove and into the net for his seventh goal of the season. Although they allowed a tally from Lowell freshman forward Charlie Levesque with 4:20 remaining, the first period was one of the Terriers’ best 20-minute frames this season. They outshot the River Hawks, 24-7, while winning nine faceoffs to Lowell’s five. BU appeared to sustain a significant blow to their defense in the beginning of the second. Sophomore defenseman Chad Krys bravely stepped in front of a rip from Lowell senior defenseman Chris Forney, who scored two goals in Friday’s 3-2 Lowell win, and crumpled to the ice. Krys had to be helped to the bench, favoring his left leg. However, he was on the ice just moments later. He showed he was not hampered by the injury, taking a transition rip on Wall, rebounding the deflection and putting it into the net for his fifth goal of the season with 11:56 remaining in the second period. The lead did not remain 4-1 for long. Eight seconds later, Greenway grasped the puck, sidestepped Lowell senior defenseman Tommy Panico and ripped it past Wall for his second tally of the game. The goal upped the gap to 5-1. The sixth Terriers goal finally signaled the end of the night for the much-maligned Wall. After freshman defenseman Cam Crotty ripped in his first career goal from the point, Wall was pulled from net in favor of junior goaltender Christoffer Hernberg with 7:07 left in the second period. The switch provided some momentum for the River Hawks, as junior forward Connor Wilson scored 47 seconds later. However, the Terriers were not fazed. Krys, Greenway and Harper soon took advantage of a power play. With 29 seconds left in the frame, Greenway dropped a dime to Harper in front of the net after receiving a pass from Krys. Harper obliged, knocking the puck in for his second goal of the game. After a Lowell tally, freshman defenseman Kasper Kotkansalo notched his second goal of the year with 11:11 remaining in the game. He came down the slot firing away, ripping one past Hernberg for the score to make it 8-3. With 4:36 remaining in the game, Greenway secured his first hat-trick of the season. On a four-on-four, Greenway established himself in front of the net and poked in a rebound past Hernberg’s right pad off a shot from Crotty.